The former Man United defender suggested the Arsenal boss’ transfer policy is either “naive” or “arrogant”. Arsene Wenger: "Everybody is entitled to that opinion. " 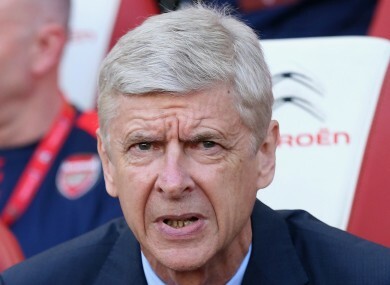 ARSENE WENGER HAS questioned Gary Neville’s assertion that his transfer policy in the aftermath of Arsenal’s last Premier League title can either be described as “naive or arrogant”. Speaking ahead of Arsenal’s 0-0 draw with Liverpool at the Emirates Stadium on Monday, Sky Sports pundit Neville was scathing in his assessment of the profile of players Wenger signed between 2004 and 2009. “I can’t think of a word to describe that bunch — I could but it wouldn’t be usable on television,” said the former Manchester United defender. “They’re certainly not what I would call what you want to win you a league, the powerful characters, the strength you need running through your team. “I just cannot get my head around why he would not sign players of power to assist these talented players you’ve got to enable them to win the league. Neville’s words were put to Wenger in the aftermath of Monday’s game, with the Frenchman insisting he could prove the England coach wrong. “Look, I don’t know what that has to do with arrogance,” he said. “I try just to do my job well for 20 years. I leave judgment to everybody else, the assessment of the quality of my work. “Everybody is entitled to that opinion. I could prove to you that it’s not necessarily right but let’s not go into that debate tonight. Email “Arsene Wenger hits back at Gary Neville jibe”. Feedback on “Arsene Wenger hits back at Gary Neville jibe”.